Tis the season of certification updates. 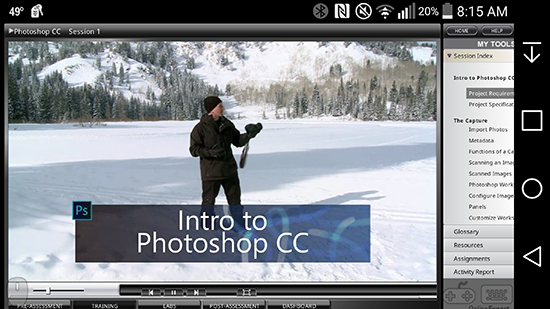 Earlier this year, we released a brand new Network+ course to follow the new Network+ exam. And, we are working on new courses for CISSP and A+, as we have detailed in recent blogs. Soon, we will be adding to our course updates the new Project Management Professional (PMP)® course. PMP® is the most widely recognized project management certification in the industry. And, to keep up with the ever-changing theories and practices of project management, the Project Management Institute will be updating their PMP® exam early next year. For those of you who are familiar with the PMP® certification, the Project Management Body of Knowledge (PMBOK)® is not changing, but the tasks on the exam are changing. What is also not changing is our expert extraordinaire for this course. We are very pleased to bring back Michael Solomon, the LearnKey expert who delivered the previous PMP® course, to bring you all up to speed on what the new exam will look like. The new PMP® course will, in addition to Michael’s expertise, contain hundreds of practice test questions in the form of pre-assessment and post-assessment test questions, all with the goal of preparing you for what many have described is a very “wide” exam in that the topics can be very wide-ranging. The PMP® certification is not built for new project managers. In fact, PMI requires, depending upon your college education, the equivalent of about two to five years of project management experience. The benefits of obtaining a PMP® are many. First, with the requirements of project management experience just to sit for the exam, having a PMP® proves that you are an experienced project manager. Secondly, the average starting salary of a PMP®, according to several web-based sources, is 15-20% higher than that of a project manager without a PMP® certification. Finally, the methods and structure used to manage projects using what you learn in the PMP® exam will prove much value and clarity in any project you manage. So, if you have project management experience and have been deciding when you should pursue your PMP® certification, let 2016 be the year! Soon after I became the LearnKey Senior Instructor, I took a little road trip down to the corporate office in St. George, UT to meet many of the staff members I had not met, have a meeting or two about building the best course we possibly can (which we are working on now with the upcoming A+ 220-901 & 220-902 courses and other series), and of course, I did manage to squeeze in nine holes of golf. While I was there, our IT Support Services Manager, Kevin Jacobsen, asked me “Hey..have you ever used the Puffin browser on your phone? It’s great!” Of course, I asked how it was great and he proceeded to show me how Puffin actually does something a lot of mobile browsers do not do, and that is play Flash files! So how does this happen? Puffin supports a Flash engine over the cloud, allowing the browser to play Flash files. The speed is just about as good in the mobile browser as it is on a regular PC. Puffin also displays most pages in their full web view, not in mobile view. So while this helps our course player, you may want to think twice about doing a crossword puzzle on a website on your smartphone using Puffin. Anyway, I highly recommend this browser as now, you can view our courses from practically anywhere on a mobile device, using Puffin. You no longer have to think “Oh, I would study but I just don’t feel like getting off of this cozy couch to get my laptop.” You can view the courses on your device. CISSP Online Training Coming Soon! Hello, there. It’s your humble senior instructor again, letting you know about yet another top-notch course we are in the midst of producing and will be releasing soon. The course I am telling you about today is our updated Certified Information Systems Security Professional (CISSP) certification course. The fine folks at the International Information Systems Security Certification Consortium (ISC)2 have recently updated the CISSP exam and the objectives on the exam. So, we brought in our CISSP expert, Michael Solomon, to bring us up to speed on what is new in the 2015 version of the CISSP exam. Secondly, the areas of asset security, security assessment, and testing have greater weight on this exam than in the previous CISSP exam. Plus, the exam is being updated to cover the latest in security threats and vulnerabilities. So who is the CISSP for? According to (ISC)2, the CISSP is an ideal certification for people in positions such as Security Consultant, Security Manager, IT Director, Security Auditor, Security Architect, Security Analyst, Security Systems Engineer, Chief Information Security Officer, Director of Security, or Network Architect. In other words, it is a great certification to have if you are a security professional. To best equip you for this exam, we not only will present Michael’s top-notch instruction, but we also will have for you pre-assessment tests and post-assessment tests for each of the eight domains. While you are waiting for this course release, take the time to check out (if you have not already), our CompTIA Security+ course and our newly-released CompTIA Advanced Security Practitioner Certification courses as they are strongly related to our upcoming CISSP course. Project 2013 Exam Prep (74-343) Course – Coming Soon! At LearnKey, we are always striving to produce the best and most innovative courses possible. In line with this, we are excited to announce that we will be adding to our library some exam prep courses. These courses are short in nature (two hours or less) and are focused on one task– to help you get that last bit of confidence you need to pass a certification exam. The first course in this series is an exam prep course for Project 2013, specifically for exam 74-343, Managing Projects with Microsoft Project 2013. This is meant to be a complementary course to LearnKey’s Project 2013 course, authored by LearnKey expert Michael Solomon. This exam prep course will focus on each exam objective, line by line, and will get you the last bits of information you need to confidently walk into the testing room and walk out with a Project 2013 certification. Whereas Michael Solomon did an excellent job covering Project 2013 wall-to-wall, this course focuses on the detailed aspects of the Project 2013 (74-343) exam. Over the next several months, many of our courses (especially the larger courses such as A+ 220-901 and A+ 220-902) will feature a session strictly devoted to final exam prep tips. Do keep in mind that these exam prep courses, or sessions, are not a replacement for the actual course. They are meant to be one of the final pieces of your obtaining a certification, along with, of course, post-test assessments, and real, hands-on practice in the application for which you are pursuing a certification. Be on the lookout in the next month for the Project 2013 Exam Prep course. In the meantime, stay tuned to this spot to see news on future exam prep courses. You do not have to wait for this course to get solid exam prep advice. If you have not seen the blog we posted last week on test-taking tips, go check it out. Today I am excited to tell you a little bit about MTA Mobility and Fundamentals (98-368), our upcoming MTA training and certification course. As with any certification track, new MTA exams come out from time to time. This year, Microsoft released exam 98-368 (Mobility and Device Fundamentals) and 98-369 (Cloud Fundamentals). We at LearnKey are happy to announce that over the next several months, we will be producing both of these courses. Specifically, I want to talk to you today about 98-368. This course, due to be released this fall, replaces exam 98-349 as the IT world partially transfers from laptop/desktop environments to laptop/desktop/device environments. This exam will cover managing devices both from a user standpoint and an administrative standpoint. By devices we are talking mostly about tablets, but the course will also look into deploying company-based apps and other infrastructure pieces onto smartphones. This course will include video training, solid test prep materials in the form of practice test assessments and a course workbook, and labs to help you practice the concepts needed not only to pass this exam but to also confidently administer mobile devices in your workplace. The Microsoft Technology Associate (MTA) certification track is a great way for those looking to enter the IT career field to gain knowledge and a Microsoft certification, which will always enhance a resume when looking to obtain a position. 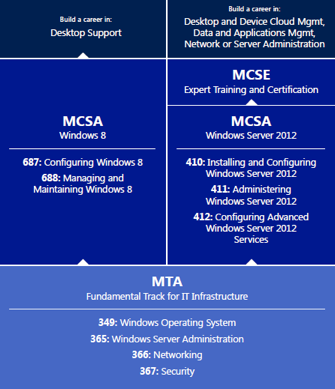 The MTA certifications are in the first rung on the ladder of Microsoft certifications. Once a person has some tangible experience in an IT discipline, the next certification to get is a Microsoft Certified Solutions Associate certification (MCSA). From there, the next level of expertise and prestige in Microsoft certifications is that of a Microsoft Certified Solutions Expert (MCSE). We currently have five MTA courses in our library and plan on releasing a sixth course by the end of the year. If you think a career in the IT field is for you and the MTA certifications are your path, give us a call or visit our website and we will get your started. New A+ Certification (220-901 & 220-902) courses on the Horizon! Hello, it’s me again, your humble senior instructor. From time to time, I will be sharing with you all what we are working on, so that you will know what training and assessment courses to look forward to over the next couple of months. This will be a very interactive and engaging learning experience consisting of video-based instruction, a comprehensive project workbook, and test prep material that will sharpen your skills for the two A+ exams. This course will also prepare you for the typical job an A+ certified person has – that of an entry-level IT technician. This course will enhance your knowledge of computer hardware, mobile devices, networking, troubleshooting, and working with operating systems. This course is going to continue to use the training methods we incorporated in our recently released Network+ course, that of outcome-based learning. Learning is always more fun and engaging when you have finished outcomes you can use to tie back to real-life situations and, of course, passing certification tests. So, stay tuned as we work to bring you a truly engaging A+ learning experience that you will want to give, well, an A+ grade! I am excited to share with you today some information about our CASP exam preparation course. This course covers the objectives for the CAS-002 exam and will prepare you to successfully earn this CompTIA Certification. This CASP certification course is perfect for those who are Security+ certified and are looking for the next step up in the world of a certified security expert. According to LearnKey expert Tom Carpenter, who is the expert for this course as well as our Security+ (SY0-401) course, this CASP training and assessment course is for those who are well-experienced in IT and in hands-on, practical security experience. Specifically, this certification targets those who have 10 or more years of IT experience and 5 or more years of hands-on, practical security experience. So what makes this CASP certification so prestigious? For starters, CASP is approved by the U.S. Department of Defense to meet Information Assurance (IA) technical and management certification requirements. Furthermore, many top corporations, including Dell and HP, make this a staple for their advanced security personnel. With the heightened awareness regarding overall information security and cyber-security, the demand for a cyber-security professional is high. In fact, according to careerinfonet.org, the job of Information Security Analyst is the second-fastest growing occupation for those with a college degree. Exam CAS-002 itself covers five major domains: Enterprise Security; Risk Management and Incident Responses; Research and Analysis; Integration of Computing, Communications and Business Disciplines; and Technical Integration of Enterprise Components. For this 80-question exam, you will want thorough knowledge and experience in all five areas. In the course, Carpenter points out that though the test objectives do not specifically mention knowing how to administer operating systems both from a Graphical User Interface (GUI) and via a command line, you will want to make sure you have that knowledge for this test. So, if security is your interest and you have a combination of experience and certifications, this course is the next step in your security career. For more information on other LearnKey courseware check out our product listing on our website.